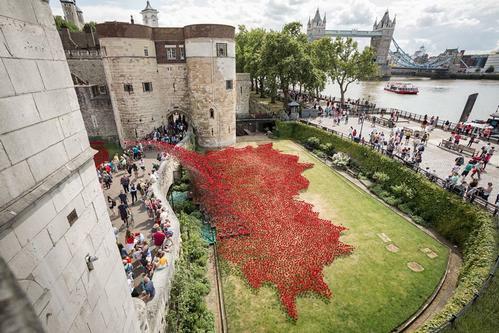 11 November 2014: More than four million people are expected to have visited an installation at the Tower of London to mark the centenary of the start of World War One by 12 November. Blood Swept Lands And Seas Of Red by ceramic artist Paul Cummins has proven so popular there have been calls for it to be extended. To allow as many people as possible to see the installation, the hours that the site will be illuminated will be extended. From Friday, the poppies will be lit from 04:30 GMT until dawn and then from dusk until midnight. The first ceramic poppy was planted in July and the final one will be added on 11 November. By then, 888,246 poppies will fill the moat, each one representing a British or colonial death during the conflict.